On five warm and mostly sunny days over the Columbus Day weekend, the Hamptons International Film Festival celebrated their silver anniversary. There were numerous foreign and domestic independent films, talks with major stars, panel discussions, and parties all over East Hampton and Southampton. Although enjoying the many wonderful films, I always look forward to listening to the “Conversation With,” and over the years this feature has grown from having one or two major stars, to three or four. This year, there were actors Annette Bening, Sir Patrick Stewart, and actor/director and political activist Rob Reiner. Long-time actress/singer Julie Andrews, known out here for her involvement with Bay Street Theater, was also honored with a Lifetime Achievement Award. I was excited to see Annette Bening, who is one of my favorite actresses, and she is also a favorite of Alec Baldwin, who introduced her on the stage of East Hampton Middle School. Looking prim and trim in a black, tailored suit, Bening sat opposite Bob Balaban for her onstage interview. He asked her about the movie she starred in, “Film Stars Don’t Die in Liverpool,” which premiered at the festival. She played Golden-era actress Gloria Grahame, who had a relationship with a much younger man, Peter Turner. Later, during a question and answer session with the audience, someone asked Bening which movie was her favorite to act in, and she said it was probably “Bugsy,” where she met her husband, Warren Beatty. 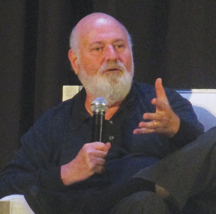 I also enjoyed listening to Rob Reiner talk about his long acting and directing career, starting with his famous role as “Meathead” on the Archie Bunker TV series. He talked about how his famous father, Carl Reiner, influenced his life and got him interested in movies. Reiner was interviewed at the East Hampton Middle School by HIFF Artistic Director, David Nugent, who always does a fabulous job of choosing the best films for this festival. Before the interview, Nugent credited Reiner for having a big impact on him with the movie “Stand By Me,” when Nugent was only 13 years old. “This movie created a love of cinema for me,” said Nugent, “and I also loved how he directed other movies, like “When Harry Met Sally,” “Spinal Tap,” and “Misery.” They then talked about Reiner’s new movie, “LBJ,” which premiered in the festival, starring Woody Harrelson as Lyndon Baines Johnson. Saying he is now making a new film about the Iraq war, Reiner explained how he favors independent films over the mass produced ones. He praised the HFF for showing many of these great indie films. During the Hamptons International Film Festival, there were dozens of films from different categories as Conflict and Resolution, Documentaries, Student Films, World Cinema, and Views From Long Island. I loved a film from this last category called, “Killer Bees,” about the champion Bridgehampton High School basketball team. This movie, made by local brothers Benjamin Cummings and Orson Cummings, premiered at Bay Street Theatre and Southampton Theater. It told the history of the school and this team, winning championships and trying to keep the school open, despite people trying to close it down and develop the property. It told the story of the basketball coach, determined to help these young men develop good values, and build a better futures for themselves. Beyond just basketball, this film showed how this black community historically has tried to survive in one of the wealthiest districts in the country, and how sports play a big role in overcoming racial, social and economic adversity. Other films worth noting that I saw included “Jane,” a documentary about the fascinating life of Jane Goodall, who was devoted to researching and documenting the chimpanzees in Gombe Stream National Park in Tanzania, Africa. I also saw the closing night film, “I, Tonya,” which had a packed house at Guild Hall. This film, produced and starring Margot Robbie as Harding, showed not only the climb to the top of this famous skater, but also a behind the scenes look at her sad personal life, growing up with an abusive mother, played brilliantly by actress Allison Janney. It details the events leading up to the brutal attack on skater Nancy Kerrigan, in the 1994 Winter Olympics. The acting is terrific, and the story is riveting, despite knowing the outcome. I think this film could be headed to the Academy Awards, like many of the movies in past Hamptons International Film Festivals. 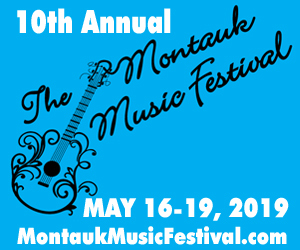 Kudos to festival Board Co-Chairs Alec Baldwin and Randy Mastro, as well as Executive Director Anne Chaisson, Artistic Director David Nugent, founding chairs Toni Ross and Stuart Suna, and founding members Linda Biscardi Fuller and Joe Zicherman, and the entire board of directors, for another great festival.